Driving!? Oh no no no.. I ain't got no time to learn it yet. No seriously. The hustle bustle of Mumbai, long commuting hours and the mad rush not giving me that piece of time to indulge in some learning. 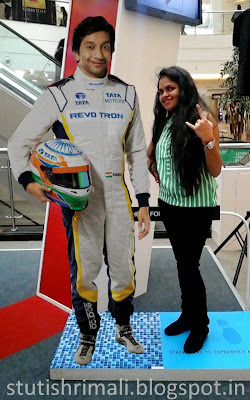 It was so till the moment I visited the Tata Bolt Arena. What beauty!? I couldn't get my hands off it and eyes were set on it continuously. Why don't I know to drive? The first question which popped in my mind. Love at first sight, so red, so bold i.e. Tata Bolt. With a mesmerized look at it, my journey of exploring the brand new Tata Bolt at Market City Kurla (Phoenix Mall) started with Mr. Ashish. TATA, the brand doesn't need any introduction and Tata Motors is that arm of Tata group which is known for being the largest Indian Automobile Manufacturer, a leader in commercial vehicles and among top in passenger vehicles. Known for its rugged looks, Tata Safari, which is actually my favorite car, has now got a competition and i.e. newly launched hatchback Tata's very own Tata Bolt. Well I love both, "equally". The fantasy for Indian roads come true, have a look on the "just so awesome" features of Tata Bolt. The fold-able back seats and the spacious interiors, On the road, lot of luggage, don't worry. Special rugby shoulder seats and you won't get tired during long journeys. It is spacious and comfortable, a superior segment. 3. Smartphone like features, navigation from MapMyIndia which will never let you loose your way and advance voice command recognition. 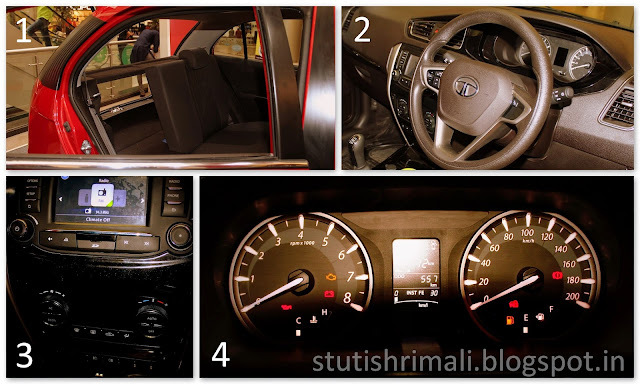 At one touch you can scroll from media to radio to pick a call (by connecting your phone via Bluetooth), changing cabin temperature and increasing / decreasing media volume as per the car speed; its all there at your service. 2. What more you can access those commands from your steering (EPAS - Electric Power Assist Steering) wheel too. That's nothing but Touchscreen Infotainment by Harman. "Connect with the world like never before". Have a look at this video and you will be nothing but amazed. Dashboard of Bolt has an addition. It has a digital piece in the middle of two dials which as per the car setting i.e. on what gear you are driving, the acceleration, clutch, speed etc. will show the mileage of the car "LIVE". The Generation Next Safety with 9th Gen ABS by BOSCH. This makes BOLT stay in control all the time with its advanced safety features, corner stability control and dual airbags. First Time Ever: The petrol version of car is the Revotron 1.2 T which is a turbocharged MPFi with Multidrive (Sport, City, Eco), a perfect balance of power and mileage. At just one click you can change the drive - mode. Choose Sport mode when you need a burst of power, Eco mode for excellent fuel efficiency and City mode for the perfect balance between the two, the choice is yours. Quadrajet 1.3 a common rail direct injection type Engine which runs on diesel with a capacity of 1248 cc. All of it gives you an exceptionally powerful driving experience. For more details, car and color variants click here. Posing with the car, I could not help but get as many pics I could with this beauty of Gen Next. Hope you enjoyed the journey. Get going to experience what I did. Get.Set.Bolt. with a test drive, click here. P.S. This post is a part of the Get. Set. Bolt. activity at Blogadda.